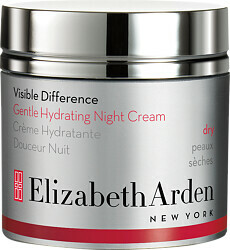 Ensure dry skin is always cared for with the Elizabeth Arden Visible Difference Gentle Hydrating Night Cream, a repairing night-time moisturiser. A blend of essential botanicals and proven moisture boosters will work to replenish the skin’s moisture levels overnight. Dry skin will feel revitalised as the moisturising cream helps skin to visibly repair itself, improving firmness and resilience. The light yet intensively moisturising cream will work overnight to treat your skin, helping you to start every morning with a nourished and cared-for complexion. To use, apply the night cream to the face and throat after cleansing and toning.